She was nicknamed the "Tour Queen" of Atlanta by fellow pilots because of the large number of sight-seeing tours she has flown all over metro-Atlanta and the Golden Isles and her ability to put the first time flyer at ease. She has also completed many missions transporting professional photographers, journalists, real estate professionals, VIPs, executives, investors, organizations and students K-12. She has often been seen flying at air shows & festivals and cow dropping — dropping stuffed cows over customer appreciation parties for the Chick-fil-a Corporation. Angie's work experience is diverse and wide-ranging. Holding a Masters degree in Psychology and a specialization in Organizational Development, she has worked as a family counselor, management and organizational development consultant for corporate and educational systems, a guidance counselor and teacher and as a small business owner. Angie's greatest delight is taking people over beautiful areas and introducing novice passengers and students to helicopter flight. 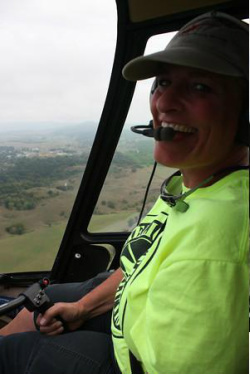 Through Dragonfly Copters, Angie is on a mission to broaden horizons by creating accessible helicopter opportunities. She believes with this accessibility comes a responsibility to empower others and hopes to use helicopters to expand accessibility to those currently without access. ALL of our staff have degrees, masters & bachelor’s in a variety of areas including education, psychology, special education & organization development, as well as expertise in experiential methods. Each member of our team also has a minimum 500 hours in flight.